This page describes the legacy mk1/mk2 disting. For the current product, please see here. 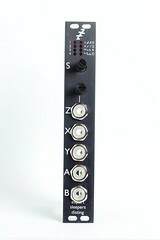 The Disting is a 16-in-1 multifunction module, offering a variety of CV and audio processes, including a selection of oscillators (LFOs/VCOs). All algorithms have two high-precision inputs and outputs, and a third control input, exposed on a front panel knob and a CV input. Expert Sleepers 'disting' on Vimeo. The video below was the winning entry in a video competition we held to promote the disting. It's a fun and very musical romp through all 16 of the disting's functions. For more detail, please see the user manual. From May 2015, the disting has been updated to a 'mk2' version. Compared to an original ('mk1') disting, the only change is an increase in the maximum delay time of the Clockable Delay/Echo mode - more than doubled to over 1.6 seconds. The disting mk2 is no longer available. It was replaced by the disting mk3. 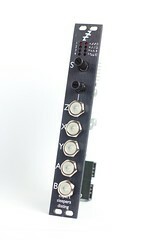 The Disting is based around a PIC microcontroller, with a programming/debug header available on the board. Using Microchip's free development tools a user can easily hack the Disting to perform their own functions. We have provided an open source code framework into which developers can slot their own algorithms. This can be found here. There is a thread about disting firmware hacking on the forum here. 1:16:45 - compilation of some custom code and seeing how it sounds.